The last months we worked hard to present a new version of TUBfind today. Most changes happened in the background: we upgraded the software beneath. But luckily there was also some time for improvements to design and functions, we hope you enjoy. If you like, we put a hold on the book, as soon as it is available at TUHH library. 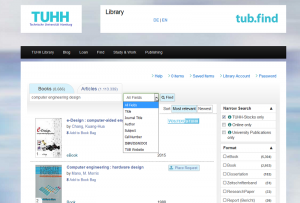 In TUBfind you can include other library holdings in your search. In case we do not own a title, additional options are shown. You may either order the book from other libraries by interlibrary loan or send us an acquisition proposal for this title. Use the check box to search other libraries as well. Since the end of April access within the TUHH intranet has been possible to the online books of the publisher Wiley. Now you can find them also in the catalog of the TUHH library. Until March 2014 we offered access to about 700 titles online. In addition, now you have access to more than 14.000 titles. Via the Wiley Online Library and its browsing function, after a click to view all products of the “Topic” you are interested in, filtering for online books is also possible. 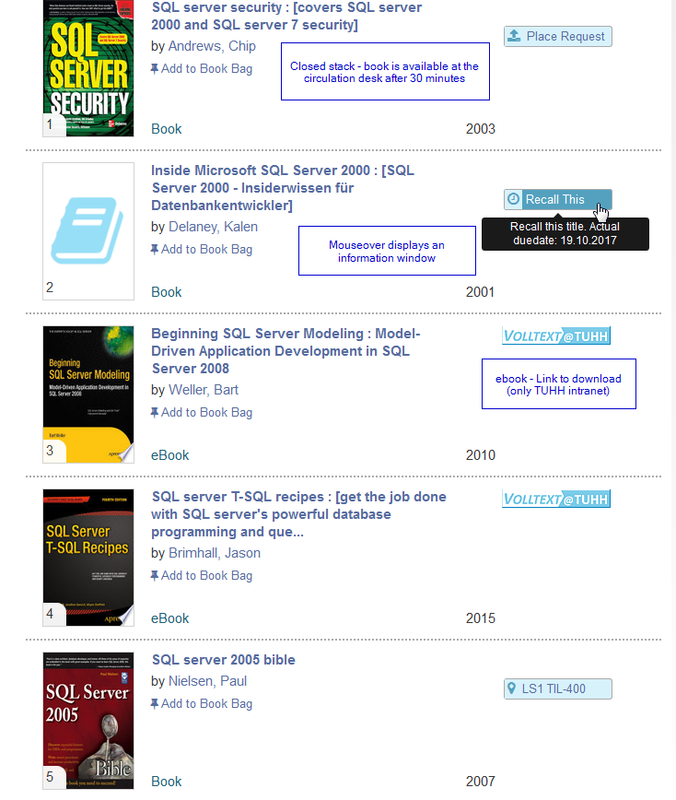 All the books are available until the end of December 2014. Your use of the online books will co-decide which books will be accessible permanently afterwards starting from 2015. Integration of further data now improves searching the literature via TUBfind appreciably. You clearly find more journal articles at present. Therefore your hits appear in two categories: “Books and more” and “Articles and more”. This separation makes surveying the list of results easier. Are you a student and looking for textbooks? In this case “Books and more” is the right choice. Or are you interested in current research? Please choose “Articles and more”. The advanced and modified TUBfind is offered to present the digital and printed resources of the TUHH library more reliably and still more easily. Please leave your feedback and comments here. Saturday 01-03-2014 in TUBfind no availabilities, no online interlibrary loan possible! Because of maintenance works at our hosting partner GBV online interlibrary loan will not be possible and databases of GBV will not be usable 01-03-2014 during 8:00am – 4:00pm. In TUBfind you will miss the information of availability. In TUBfind and also in Classic Catalog Interface there could be delays by searching. We apologize for any inconveniences! nationwide licenced content can be found comfortably in one single result list. In contrast to our conventional catalog, with TUBfind facetting options are coming, to narrow down the result. Exports into literature management tools of your choice of course are also available. With the relaunch of our homepage, which will come soon, our search option will be switched to TUBfind by default. When you will be searching using the query slot on our homepage, you will get to TUBfind automatically. Queries in our website content or in our blog are also handled with TUBfind. From TUBfind you can switch to our conventional catalog interface at any time, if you wish to. The library account supporting prolonging actions and so on, will be kept in the “old” interface only. Further information and news about TUBfind and Vufind (the underlying software) are in our TUBfind-Blog. You are welcome to tell us what you think about it by commenting this post or the ones in TUBfind-Blog. We are appreciating your feedback!